Q3. Among the (current) H!P members, who would you like to go to the sea with, and what would you like to do? Looks like ex-swimmer Kuduu is the most popular amongst the members... though given Duu's popularity, that shouldn't come of too much of a surprise. I did find it interesting that there isn't an overlap between the members who picked Kudo for this question and those who picked Kudo for their favourite member. Interesting thing about the second most common Murotan: Her name is only mentioned in isolation once, with the other mentions listing her as one person among many. They're all translated below, but YukaAarii's is just so adorable! TaguRena's highlights their relationship as well. I'd like to go with ℃-ute's Suzuki Airi and give her a crash course on how to do the crawl! Even though Airi's such a perfect human being, swimming's the only thing she can't do! (laughs) So I'd like her to be able to swim and become perfect! 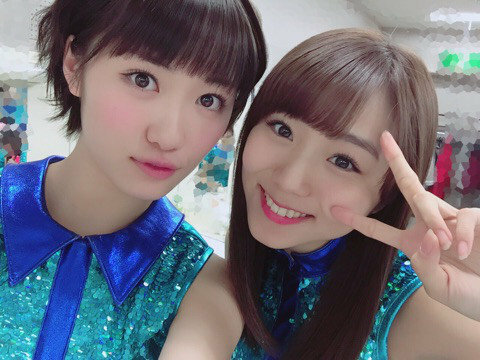 ℃-ute's Okai Chisato-chan and Morning Musume。´16's Sato Masaki. We'd have so much fun, messing around ♥ But it feels Maachan would create all sorts of problems. I'd like to go with my second and third older sisters, ℃-ute's Okai Chisato-san and Hagiwara Mai-san. When I talk with them, they always talk with smiles on their face. Anyone, as long as they can swim! But firstly, I'd like to go with the ANGERME members! I'd like to bury her in sand. Country Girls' Morito Chisaki-chan. I'd like her to teach me, since she always says that she's good at swimming, with a smug look on her face. I'd like to play beach volleyball and beach flags with Morning Musume。´16's Ikuta Erina-san, Ishida Ayumi-san, Kudo Haruka-san, ANGERME's Takeuchi Akari-san, Murota Mizuki-san, Tsubaki Factory's Kishimoto Yumeno-chan! ANGERME's Murota Mizuki-san, Aikawa Maho-chan, Sasaki Rikako-chan, Tsubaki Factory's Yamagishi Riko-chan, Kishimoto Yumeno-chan!! Firstly, the 6 of us would go in the sea, ride on a banana boat, and once we've tired out from playing, the 6 of us would build a huge sandcastle!! Finally, I'd like to have some delicious food!! Kobushi Factory's Taguchi Natsumi-chan! I think that we'll definitely get into a fight if we go together, but I think that'll make it even more fun. I'd like to go with Kobushi Factory's Ogawa Rena-chan!! I'd like to try playing tag on a sandy beach, and beach volleyball. I'd like to spend the day without having a fight!! I always thought that they had a rivalry or war between and that their friendship broke when Duu was choosen for MM and karin was left behind.